I was very cautious when approaching this book. Say what you will, you'll never persuade me that 'bestseller' equals 'good book'. 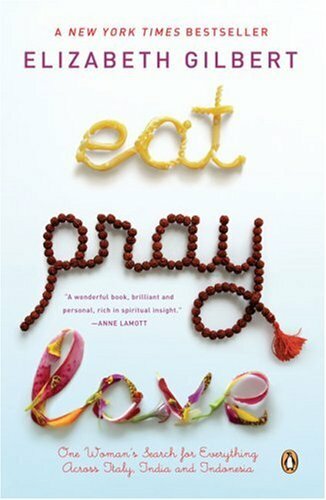 Eat, Pray, Love was a bestseller not too long ago. It sold like insane and was turned into a movie a few years after publishing. NOT a good sign. I chose it because I was suffering from overdose of heavy subjects. War and politics is all right, but sometimes you just need a break. I gulped it down within a day. It was entertaining. Well-written. Trendy. Not particularly enlightening. The heroine of Eat, Pray, Love (Gilbert herself, I wonder? Really, really?) takes a year off and travels around Italy, India and Indonesia, getting over a difficult divorce and searching for God. She starts with heavy depression, ends with a new affair and puts a lot of sightseeing in between. Yeah, a generous amount of money is the best possible cure for depression. I'm being slightly sarcastic, I admit. More cruel than necessary, perhaps. Maybe I'm just jealous. I found it extremely difficult to identify with Liz, mainly because of this crucial money level difference. I don't even know people that loaded. I want different things in life, I have other values. Still - she's likeable. Difficult to take seriously after stories from war zones, but likeable. Sometimes even inspiring.